Thanksgiving morning one year ago, I spent in my parent's warm, turkey-scented kitchen while my mom and sisters scurried around making voluminous amounts of traditional foods. I made a chocolate salted caramel pecan pie because...we were in America and Americans do that kind of thing. It was my first Thanksgiving with my family in 9 years, and I loved all the traditional foods and all the traditional people, plus a handful of new children! This year I am looking forward to celebrating Thanksgiving with the other teams in our province. Thanksgiving Day itself probably won't be anything out of the ordinary, but this year I am delighting in thankfulness. If I could go back and re-choose my "one word" for the year, it might be gratitude. It's not that I have been amazingly grateful all year, but it may be the most important lesson I have been learning throughout the year. Actually I spent the first part of the year stewing in discontent. I was stressed with the thought of all the changes coming up as we ended our time in the States. 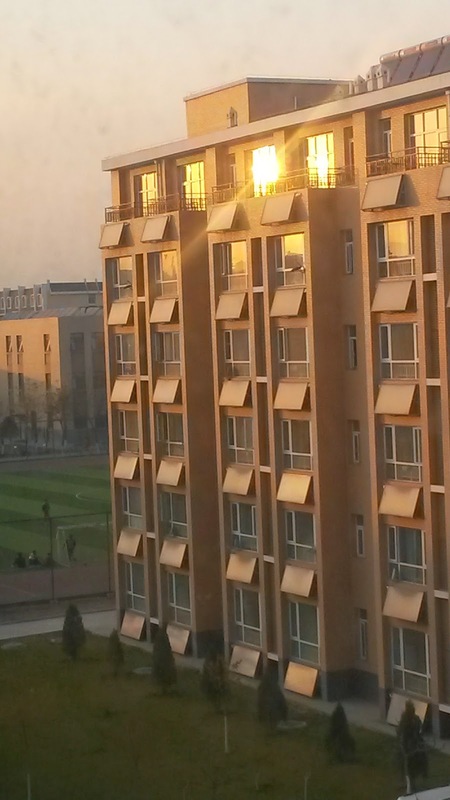 I was frustrated that months after moving back to China, settling into our new apartment and school and teaching positions, I still felt so unsettled! I pushed against the constraints of mothering; planning my life around naps and nursing, telling my stubborn 3 year old the Same Things every other minute of every single day. I looked longingly at other people's lives and was frustrated that mine didn't seem to be working as well as theirs. I stewed over the days filled with endless, seemingly empty tasks. Laundry and more laundry and didn't I just cook last night and now people expect to eat again? Shouldn't life be more meaningful? Where was the Important work I was supposed to be doing? There were many happy moments as well, as my baby's first year flew by, and as my 3-year old occasionally broke out of her "I rule the world" delusion, but often I just dreamed about getting away. When I read back over my occasionally-kept journal, I see themes of discontent spring up everywhere. I was exhausted from discontent. Also from not sleeping, but discontent emptied my soul every day. This summer I came across Ann Voskamp's book 1000 Gifts. I had been hearing about it but started reading a bit skeptically because the writing seemed rather flowery. I discovered I not only found the writing beautiful (although it was flowery and I did do some skimming), I also loved what she had to say. There are many times I have read an inspiring book, but soon after I finish reading the inspiration fades. What I appreciated about this book is that it introduced a practice, a very simple habit of developing gratitude. While I've forgotten most of Ann's wise, quotable sayings, I have made the practice my own. Ann Voskamp talked about her experience with keeping a gratitude journal, simply noticing and writing down the small, everyday beauties. I started keeping my own gratitude journal, but after a few weeks I never remembered to write things down. However, I have continued noticing. And in noticing, I have realized how much beauty there is in the most simple things. The scent of baking bread. The warm sun caught in the prism, throwing rainbows across the floor. The soft, warm cheek of a just-woken baby. The silly words of a stubborn 4 year old. The feeling of satisfaction over a momentarily clean floor or empty laundry basket. The way my student's eyes shine as we discuss important things. I still grumble and take things for granted and notice the ugly, dull, and unpleasant parts of life. But I make much greater effort to stop and absorb the beautiful moments. When I see a colorful sunset, I force myself to stop and drink it in instead of rushing off to accomplish something. I have become a seeker of beauty. On the days when I am feeling crabby and ungrateful, I look even harder. I always find something. My life has changed somewhat since the spring. We are more settled. I am getting better sleep. Four-years-old has been easier than three. But mostly what has changed is not my life but my eyes. I see the depressingly old, rusted windows, but I also see the sun reflecting brilliantly in them. The beauty is there; we just have to open our eyes and see it. The 8 o'clock "go to school" bell is ringing as I snap on Juliana's helmet. Coat, gloves, towel to cover the legs, princess backpack - check. We wave goodbye to Daddy and Adalyn and head down the stairs. Here on the edge of the desert, the temperature drops every night. Right now it is 28 degrees, but long about January our early morning bike rides are going to get awfully chilly. I heave Juliana up onto the bike seat, and we are off to Kindergarten. The guard waves cheerfully as we pass through the school gate. 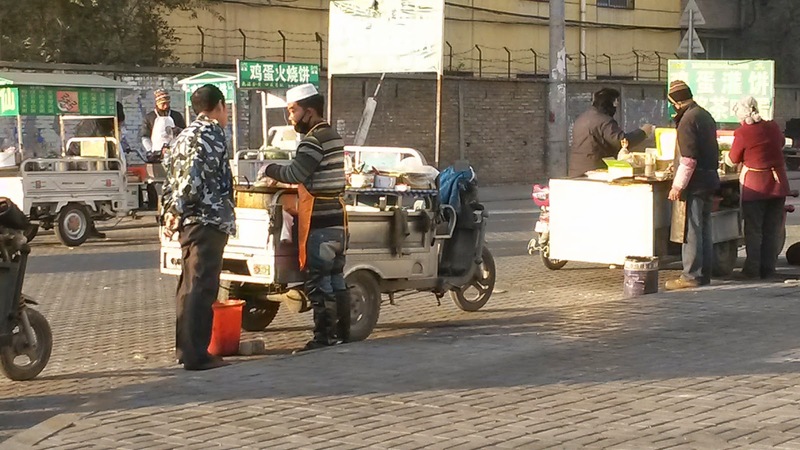 Just outside the gate, several carts sell morning snacks to the students passing by. Flat egg bread sizzles as it fries. Vendors pass out cups of hot soy milk. 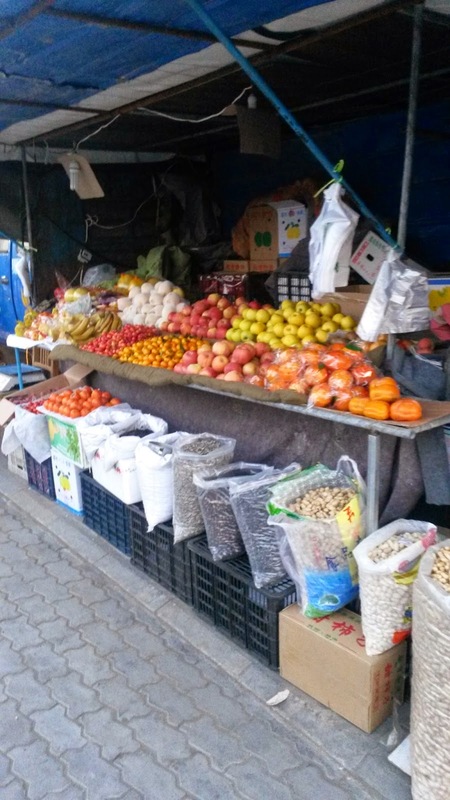 The fruit seller begins to arrange her wares. The bike repair man is already fixing a flat tire. Many of the shops and restaurants are still closed. Since China is all on one time zone, here in the "west" morning begins a little later, and shops cater to students' later hours. On the small street across from the campus gate, the morning market is in full swing. Local farmers line the street with trucks, carts, and sheets full of apples, cabbages, and all manner of produce. Grannies and housewives are already making their way back home with their morning purchases. The roads are seldom crowded out on the edge of town, but other parents drive small, backpack-ladden children to kindergarten. Middle school students, garbed in their schools' track suit uniforms, bike to school with friends. A car pulls up next to a food cart along side the road for some "drive-thru" breakfast. I enjoy biking, though I'm not looking forward to the cold winter months, but one primary disadvantage is the inability to drink coffee during the commute. The sun is still low but reflects brightly, turning old, rust-rimmed windows to brilliant orange. The snow-topped mountains are starting to show through the morning haze. Music is blaring from the local park, and through the gate we catch a glimpse of 30-40 middle aged women dancing together. They wave fans and march along to the music. 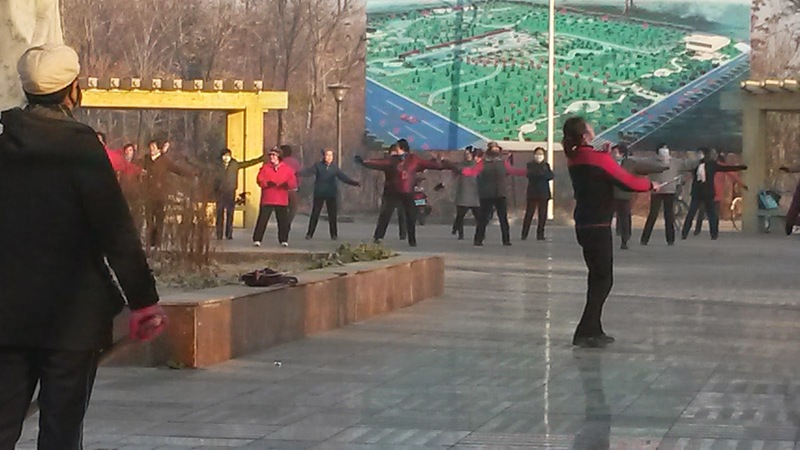 The weather is chilly, but they are warmed by their dancing - not to mention their multiple layers of long underwear. As we get closer to the kindergarten, we see more parents and backpack totting children biking and walking toward the school. The tiny road in front of the school is a mess of cars, motorbikes, and bicycles trying to get around each other during the morning drop off. Lively children's music is playing through the speakers and the guard gives each child a friendly good morning as we join the line for the morning health check. After dropping of Juliana at her classroom, I join the other parents hurrying off to work and home. The street is less crowded now. Several tractors lumber down the road with huge loads of hay. 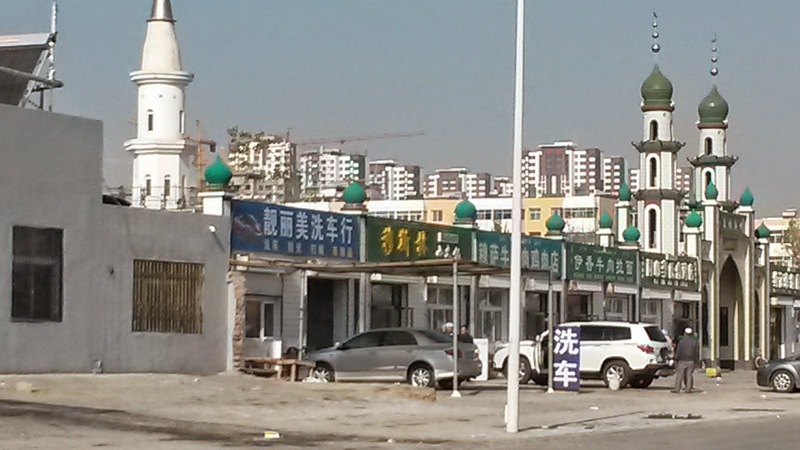 I pass a local mosque, it's green roofs peering out from behind a large gas station. I hear the tell-tale sound of "It's A Small World" as the water truck drives through spraying off the road. The street cleaners work their way down the sidewalks with large, straw brooms. A car drives down the wrong side of the street and swerves onto a side road, narrowly avoiding my bicycle. This happens so often it's not worth worrying about. You know what they say: "6 inches is as good as a mile." Instead I feel a little nostalgic for the old days of chaotic traffic, when part of the bus route went down the wrong side of the street. As more and more cars take over the roads, traffic is tamer, especially on Yinchuan's wide roads. At the park, some women are still dancing, but others are returning home. One woman pulls a large red drum on wheels. The sun is higher and the windows no longer shine. Campus is quiet; most students are in class now. The grannies have not yet brought their babies and toddlers out to play. I open the door to the warmth of home: to a baby toddling toward me, to laundry and dishes and to-do lists, and to half a cup of coffee waiting to be reheated. 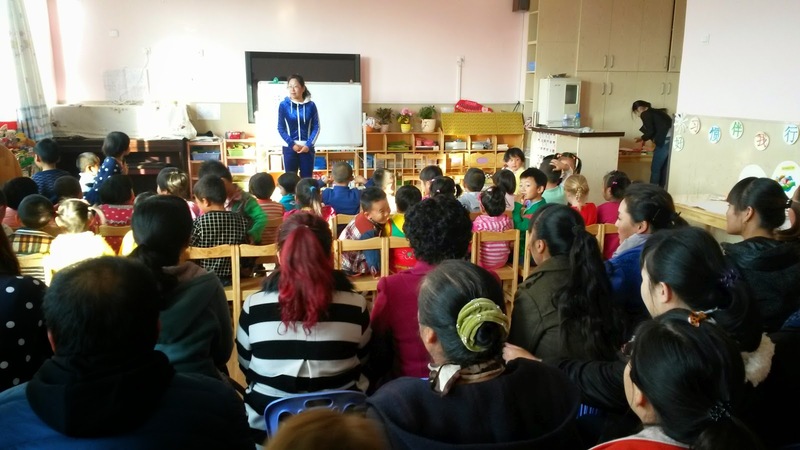 Today Juliana's 幼儿园 kindergarten had a "parents day" where parents and grandparents could come and see a typical morning of kindergarten. Since the reports we get are usually a big convoluted, it was interesting and helpful to see exactly what Juliana does while she's gone! This morning we caught a taxi to school since I needed to bring Adalyn along too. I dropped Juliana off and then went to a friend's house (The mother of Juliana's Norwegian classmate used to be my language school classmate) for a quick cup of coffee while the kids ate their breakfast. Then we headed back to the kindergarten. 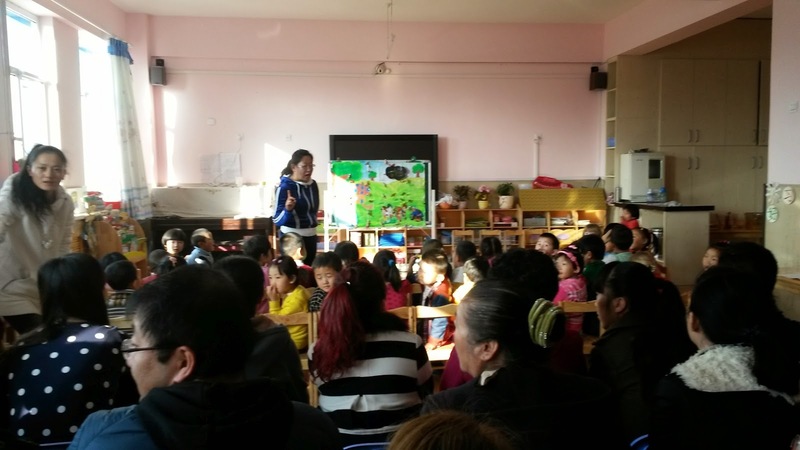 The back of the large classroom was lined with child size chairs, already crowded with parents and grandparents when we came in. The two dozen children were lined up in their own chairs near the front of the room, waving excitedly to their parents. The lead teacher asked the children some questions and then told a short story about when it rained candy. She showed a large picture which went along with the story. She asked if the children had ever seen it rain candy, and they all replied, yes, they had! She called on different children to tell what kind of rain they would like to see. Candy, ice cream, and hamburgers were some of the answer she received. She asked where they would like to see this rain, and the children answered, "Just outside my door!" or "Inside my house!" She asked what they would use to collect the candy-rain. "My hat! My gloves! My clothes!" The group of 4 year olds were surprisingly quiet and orderly. I guess this is one of the important things you learn at kindergarten! After the story, the children gathered at different tables to paint a collective picture based on the story, using paints and q-tips. 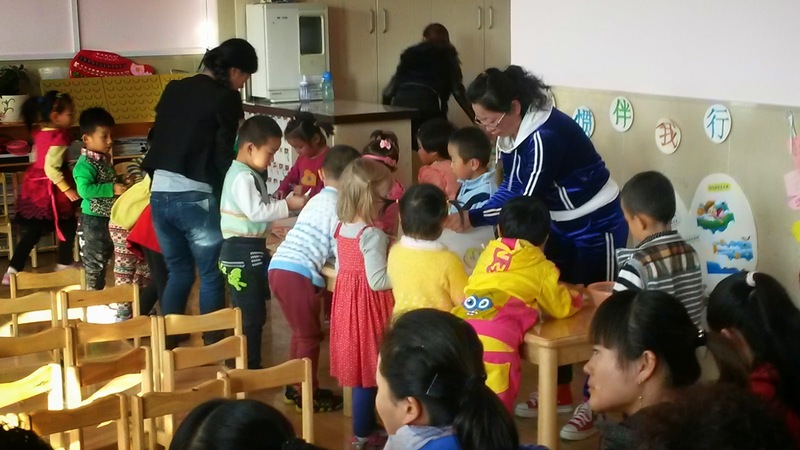 By this point the kids were getting a bit more restless, and there was a break for drinking water (they each have a tin cup in their own cup cubby), using the bathroom, and generally wandering around the classroom. Next several activity stations were set up. One group of children painted pictures. Another built with connecting block-tiles. Juliana's group used a large box of different colored cylinders to build a tower. Toward the end of the activities the calm was beginning to evaporate, and after some clean up the kids got on their coats. We all traipsed outside to the large courtyard and playground area. 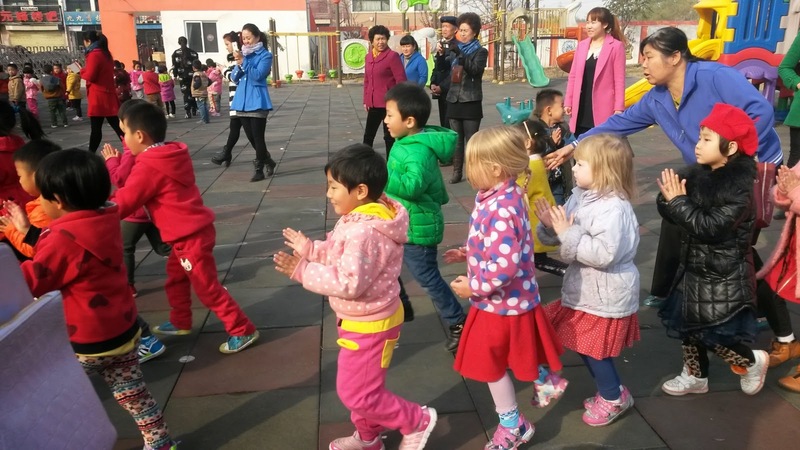 The students each lined up on a painted spot on the ground and the teachers led them in dances. I already knew the dancing is Juliana's favorite part, and she had it down pretty well! They did several different dances and Juliana seemed to know just what to do for all of them, adding a little extra hip-shaking-vigor of her own. Inside the classroom Juliana seemed a little lost some of the time. She watched the other children, but I could tell she didn't understand a lot of what was going on. I saw her stand around uncertainly, trying to figure out what she was supposed to be doing, and I felt glad she is young enough to not have developed too much self-consciousness. But dancing outside, Juliana returned to her confident self. She knew just what to do and could follow the directions better than many of her classmates. And she loves to dance! Everyday she still tells me that dancing is her favorite. 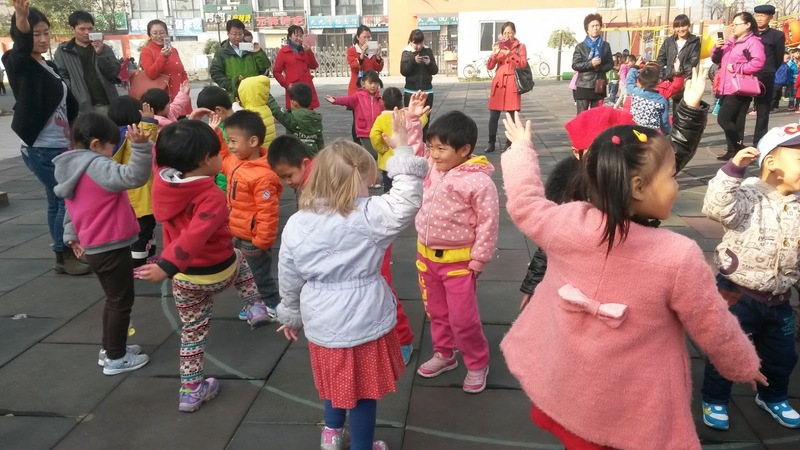 After dancing, the children got out balls to throw back and forth with their parents and had a little time on the playground. The kindergarten has a lot of great playground equipment, which is a big plus for a little kid! Outside time was over far too soon (as far as Juliana was concerned) and the kids were ushered back inside for lunch. 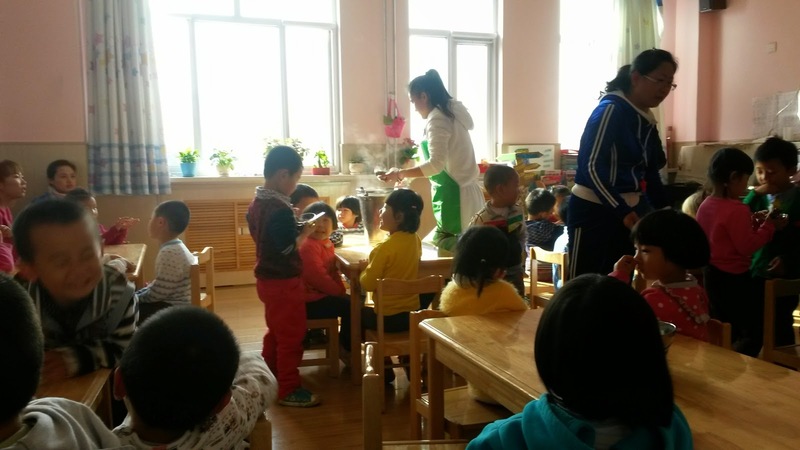 The teachers ladled out rice, meat, and vegetables into their metal bowls. 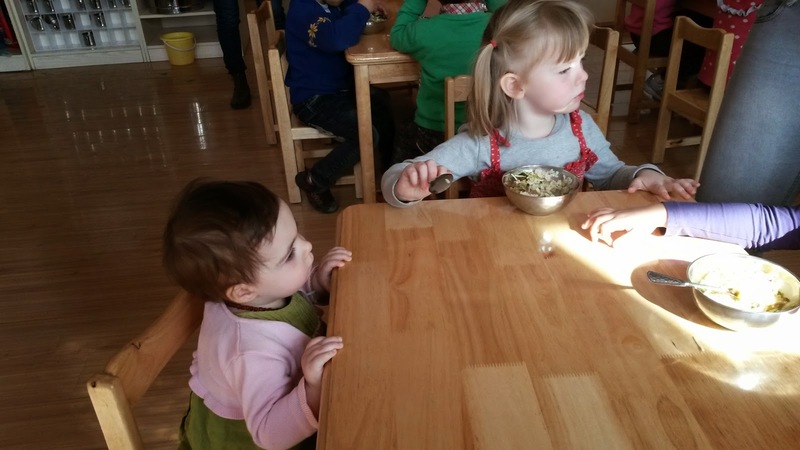 The children eat with spoons; generally chopstick skills are learned a little later. By this point all the parents were getting a bit antsy, because after the children were done eating, they could take them home. "Eat quickly. Come on, eat quickly so we can go home." Which was what I was telling Juliana as well! For Adalyn's part, she thought kindergarten was very interesting, especially being outside. Inside she charmed many grannies and aunties and uncles with her big smiles. One auntie kept asking Adalyn if she could hold her, and Adalyn kept shying away against me. Then the auntie said, "我抱抱你，给你好吃的！Let me hold you! I will give you something good to eat." Adalyn smiled and held out her arms! So maybe she understands more Chinese than I realized! I was really glad to get a better picture of Juliana's school. In many ways it seems just like I would expect from any preschool. 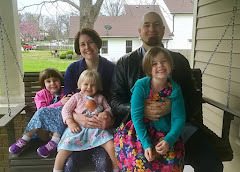 I felt a little sad thinking about how much Juliana would thrive in American preschool, if she understood everything that was going on and could interact easily with the other kids. When I watched her standing uncertainly, twirling her hair and wondering what she was supposed to be doing, I thought, “Surely this is too much to ask of a 4 year old. 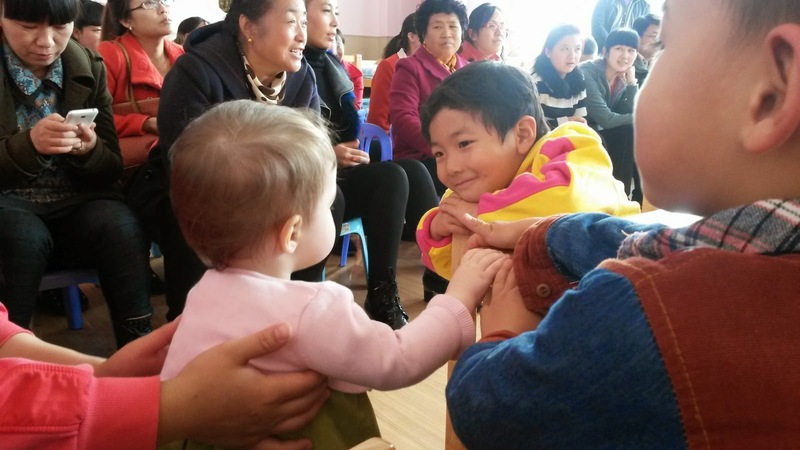 To go every day to a place where they stand out, don’t understand, and don’t fully belong.” But despite the difficulty, Juliana really seems to enjoy kindergarten. I was proud of her, as I saw her watching the other kids to see what she should be doing, as she waited patiently through the parts she didn't understand, as she dove in and got involved anyway. Her resilience and natural confidence came through. I am so thankful kindergarten has been a positive experience for Juliana! I should really do something with my hair at least occasionally. Look at all the moms who manage to look amazing all the time (or at least for Facebook photos). Maybe some makeup would help. And my clothes are looking awfully ratty. Maybe I need some new clothes. Well of course I don’t need clothes. I’ll just be contributing to the over-consumption and crazy consumerism. Most of the clothes I have were probably made by some kid or a factory worker in terrible conditions, and I try to buy fair trade now but I’m not sure how helpful that even is. I probably shouldn’t buy anything ever again. And I’m sure I could be doing something more important with the 2 minutes it would take to put on makeup, so scrap that idea. For example, I could be reading to Adalyn. I never read to her and she’ll probably grow up hating books. She’ll end up in therapy because she never gets any attention. Well, except I did hold her most of the morning because she was so fussy and screaming every time I put her down. Some people would say I’m spoiling her and should just let her scream. Maybe I should. The only thing I accomplished this morning was getting dinner in the crockpot while Adalyn emptied the cabinets and poured spices all over the floor. So we might have something to eat (though not with as many vegetables as it should and I should really take the time to make sure we eat healthier), but the kitchen is a huge mess. I should really keep things cleaner. Of course, I spend all day cleaning and trying to reign in the chaos, and that’s why I don’t spend enough time with the kids. I shouldn’t be so worried about the house being clean. Isn’t that what everyone says? I say that to other people. But every time I walk into another room I feel stressed out from everything that is out of place. Maybe I need to keep things cleaner for my own mental sanity. If I was doing a better job teaching my kids responsibility they wouldn’t leave random toys and goodness-knows-where-they-found-that items scattered over every surface of the house. Probably the time I spend cleaning is selfish, though. There are so many more important things to do. My friend was just talking about how much time they spend with mothers in the neighborhood. Our teammate is doing things with students every day. I have only had my students over once this term! I should be getting to know the neighborhood families better. Why is that so hard? I should get to know the other teachers better and try to do more things to help them. Those other teachers at that other school do so much with their colleagues and look at how good that has been. And we STILL need to write a newsletter! I just need to figure out a really captivating idea. Hmm, no captivating ideas. Maybe I just need to write one anyway. It’s been too long and everyone will forget about us. I’d like to tell about the awesome things we are doing except I’m not doing anything awesome!! Can I just talk about the laundry? I do an awful lot of that. That will be really unimpressive. They’ll probably tell us to just come home. Remember before I had kids how I had students over all the time? Good in-depth conversations. Meals. Christmas programs. Right now I do approximately nothing. I am probably impacting nobody. Does it even matter that I’m here? Of course my kids are important. But I don’t spend enough time with them either. Juliana’s preschool lessons are so haphazard sometimes. And we have already established how I neglect Adalyn. I’m so busy keeping them in cleanish clothes and eating not-quite-healthy enough meals. And our discipline is clearly not working because she is still whines and flips out and acts like we have never ever before told her not to hit her sister. She is already four years old and I’m pretty sure if we had followed someone else’s parenting method she would be duteous and respectful by now. And oppressed. Those kids are going to end up in some major teenage rebellion. Maybe I’m being too hard on Juliana. She’s only four years old. If I just spent more time with her we wouldn’t have these problems. I should stop thinking about all the things I should be doing. It’s really not helpful. And everyone knows you shouldn’t compare unless the other person really is doing more good than you which they obviously are. If I stopped thinking about it so much, then I could actually get more things done like I should be doing. Okay, I’m going to stop worrying about it and just go do the dishes or maybe first the laundry right after I arrange at time to meet my student and read a book to Adalyn except oh crap there’s still spices all over the floor! Oh forget it. Maybe I’ll just make another cup of coffee. Linking up with Velvet Ashes this week on the topic of shame. "Shame begins to loosen its grip when you begin to believe you are enough, right now, just as you are."